Details for Vendors & Sponsors Coming Soon! The Flemington Opa! 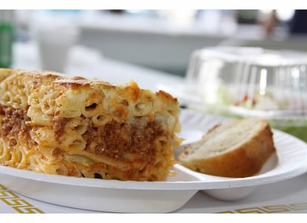 Greek Festival is the perfect event to enjoy delicious Greek Food, Greek Dancing, Shopping, & more. Voted as the "Best Foodie Event" on the Hunterdon Happening List, this event is sure to please. Savor freshly grilled meats, gyros, and traditional oven baked specialties. Relax with a Greek coffee and pastry or some Greek wine or beer and meze. Enjoy the last few days of summer eating outdoors or in our air conditioned dining hall. 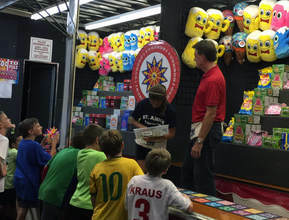 Eat, Shop, & Play at the Flemington Opa! Serving delicious Greek Cuisine from the Kitchen and the Grill. 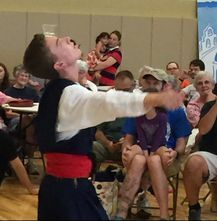 Greek Folk Dance troupes will entertain throughout the weekend. Try your skill to win a prize. Fun for the young and old! An array of vendors to please a range of interests from jewelry to fine art, and home decor. Fun activities for the young including pony rides, face painting, and more! A portion of entrance donations supports charities such as the Flemington-Raritan First Aid & Rescue Squad. Find your 'Kefi 'at the Flemington Opa! Come be Greek for a Day!